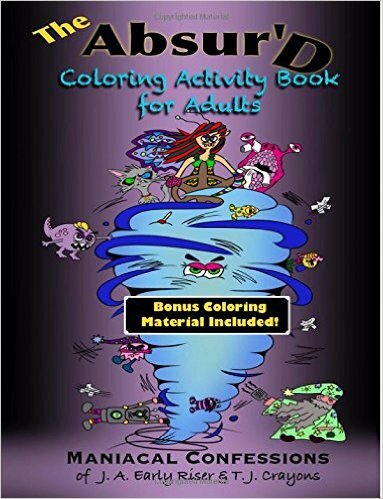 The 3-D series of coloring books by Dover is a bit different than your usual coloring book. For one, each book comes with a pair of cardboard/plastic 3-D glasses that you use after you’ve colored the images. Second, in order for the 3-D effect to work, you have to be very specific with your color choices. The idea behind coloring these designs is that warm colors will “pop” off the page when using the 3D glasses, and cool colors will “recede,” giving you the illusion that some parts of the image are in front of others. This particular book contains 118 pages of double-sided abstract designs by Jessica Mazurkiewicz. In the larger books Dover publishes, sometimes they repeat designs, which is the case with this book. You get 60 designs, which then repeat. I’ve listed this book at 118 designs, but I suspect it is supposed to have 120, because one of the pages is not repeated in my copy. I’m not sure that’s true, but it seemed odd that all the designs repeated except for the last page in the first set of 60. 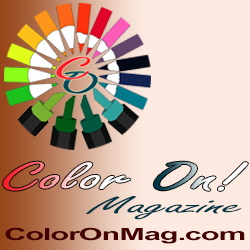 Some of the designs are a bit more complex, but most of the designs are suitable for a beginning colorist. There are very few designs which have small spaces to fill in, and those that do tend to be in the set with thick lines, so even beginners shouldn’t have any trouble with them. The designs range from simple geometric shapes repeated across the page, to more organic shapes, to shapes that overlap and interlock, and designs that resemble mosaics or mandalas. 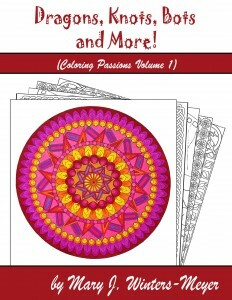 If you like coloring abstract shapes, you should enjoy the large variety in this book. You definitely won’t feel that you are coloring the same design over and over!